In the previous article, I wrote about the construction of the homemade adjustable safety squat racks. In this article, I'll discuss some of the finishing touches you can do. My homemade squat racks have served me for quite a long time and in that time, they've pretty much held up. I only had to repaint the metal parts once. Of course, functionality and safety prevails over aesthetics so your mileage may vary here. Use epoxy paint, if you have a choice. Epoxy paint adheres well to metal and so you're left with a finish that's durable and doesn't come off nor fade easily. Over time and with constant use, metal parts get dinged and scratched. Eventually, rust may form. If rusting gets a bit heavy, lightly rub the area with sandpaper and then apply a rust converter chemical. The rust converter converts the remainng rust into a hard grayish material. The level holes that were drilled on the metal tubings are spaced 2" apart. Mine have level numbers from 1 to 8. 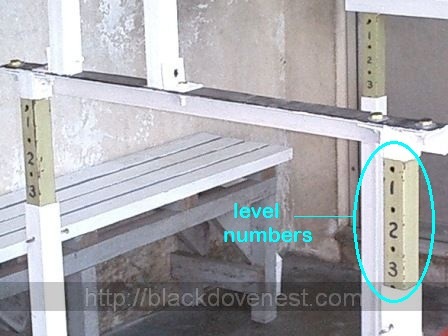 I put level numbers to indicate to me the desired height I want. They also tell me if the whole squat rack setup is flat or horizontally level. A dangerous scenario is when the whole setup was assumed flat when in fact one or two posts were higher, and the heavy barbell suddenly comes rolling down because of the unexpected incline. On the other hand, the level numbers also allow me to intentionally incline the squat rack a bit should I need it for an exercise with dumbbells (more on that in later articles). For easier readability, ensure the paint color of the level numbers is in contrast with that of the background. The level numbers I used are colored black and the color of the metal tubings is olive-green. Lightly spraying the metal tubes with a spray lubricant or applying oil ensures everything slides up and down easily. It also has an added benefit of protecting the metal parts from rust. Just be aware of these lubricated areas or you'll get some oil on yourself and your clothes during the workout. In the previous article, I mentioned some of the non-metal add-ons that went to the construction of the squat racks. Generally, they're there to avoid the metal-to-metal banging as you return (or drop) the barbell on the squat rack. Here's a brief explanation for their use. Rubber Garden Hose - Rubber coats the barbell catch and provides traction so the barbell bar doesn't roll as easily. Additionally, it provides traction to your hands should you use the steel pipe as handle bars for dips. Rubber Tube Caps - For safety purposes, cover exposed bolt ends (the threaded part) with rubber tube caps. These can easily be found in hardware or garden supply stores and are used to provide footing for the bottom of the legs of garden furniture. Rubber Tire Interior Tubing - These may function as rubber lining on the topside of the safety bars. They protect the metal safety bars when the heavy barbell is dropped. You may also want to cut small pieces of rubber to cover the top of the bolt heads that jut out of the safety bars. Foam or Rubber Tiles - Small pieces of these were cut and glued on the underside of the post's feet. 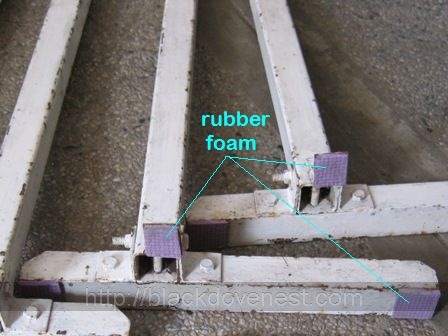 These foam or rubber pieces prevent slipping and protect your floor. Adding these finishing touches help provide you with safe workouts for your exercise program. I just wanted to say that I'm new to your website and think that your information is great. I wish I had seen the directions for making a squat rack before I had purchased some saw horses! Great job, keep up the good work and I will be attempting to create my own safety racks soon! Thanx and good luck on your diy projects!